Event Listening in Android development is largely centered around the View object. This pattern works for any of the view-based event listeners. Troubleshooting: Item Click Not Firing If the item is more complex and does not seem to be properly responding to clicks after setting up the handler, the views inside the item might be drawing the focus. Check out this stackoverflow post and add the property android:descendantFocusability="blocksDescendants" to the root layout within the template for the item. In addition to the listeners described above, there are a few other common listeners for input fields in particular. This is great for any time you want to have the UI update as the user enters text. 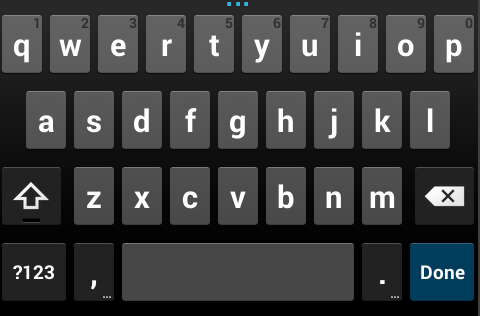 Another case is when you want an action to occur once the user has finished typing text with the Soft Keyboard. Keep in mind that this is especially useful when you can see the virtual keyboard which is disabled by default in the emulator but can be enabled as explained in this graphic. This is often great whenever a user needs to type text and then explicitly have an action performed when they are finished. There are many imeOptions for different situations. Almost all input views have similar methods available.